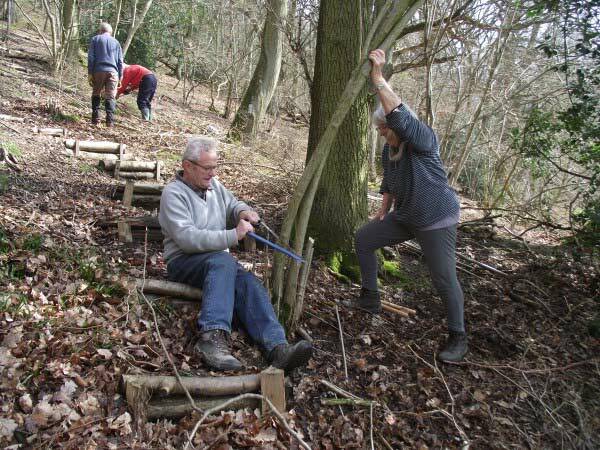 Coppicing parties are becoming a regular part of our year – either towards the end of winter when the birds aren’t yet nesting, or in the autumn. 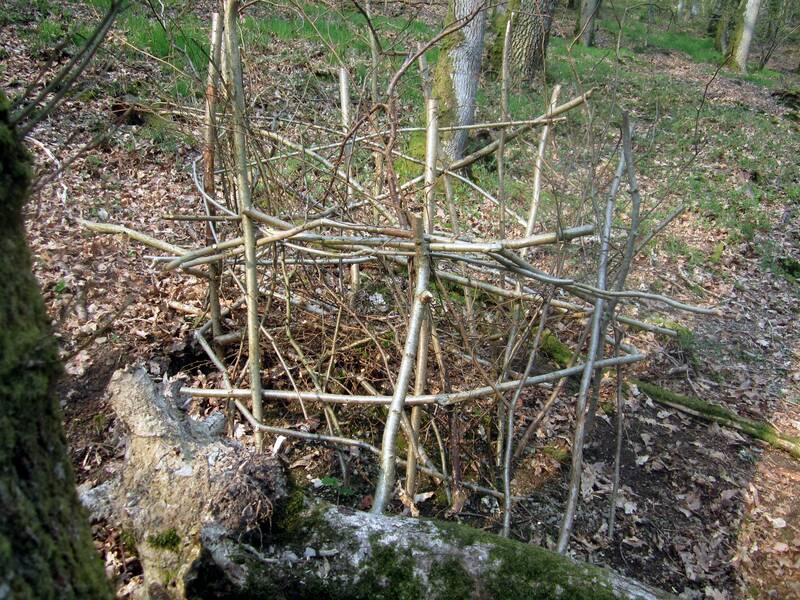 Left unattended, hazel bushes are not thought to live much longer than seventy years, but coppicing stimulates suckers from the roots which is reckoned to extend the life-span to possibly 300 years, or maybe more because no-one was counting back then. In addition to simply keeping the hazel alive, we’re doing this because healthy hazel provides food and shelter for a whole range of animal life, and one of our aims is to increase diversity. If we do eventually decide to create areas of greater light by felling one or two of the larger trees, that may enable the hazel to produce catkins and nuts, both of which provide more food sources, but whether that will be sufficient to attract dormi ce is quite another matter. The ecology survey that was carried out in 2012 found no evidence of them, although now that the landowner who owns the field on the southern edge of the quillet has dramatically cleared her field perimeter, there is already a lot more light getting into the lower end of the quillet, and that alone might bring hazel catkins in a year’s time. Deer damage is a worry. The hazel stools we’ve created so far don’t appear to have been badly nibbled, but as a precaution we’re experimenting with a number of ways of protecting them. The obvious, but most expensive method is to surround the hazel with fencing, and we have been given some short lengths of mesh fencing to use. 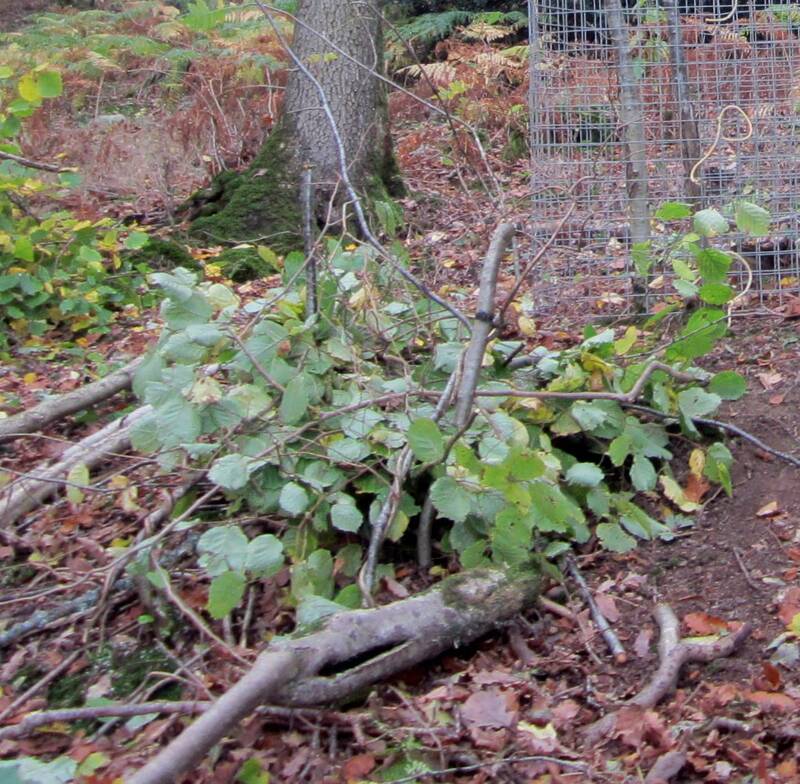 A shorter-lived but far cheaper substitute is a barricade made from the hazel trimmings themselves, which so far seems quite effective. The easiest method is to simply pile the brash on top of the stool from which it was taken. In addition to those methods, we’ve deliberately left some stools unguarded as controls. Time will tell which does or doesn’t work. We’ve no w almost finished coppicing the hazel in our own quillet, but two neighbouring quillet owners have said that we can move into theirs. Although a lot more work, we welcome that. 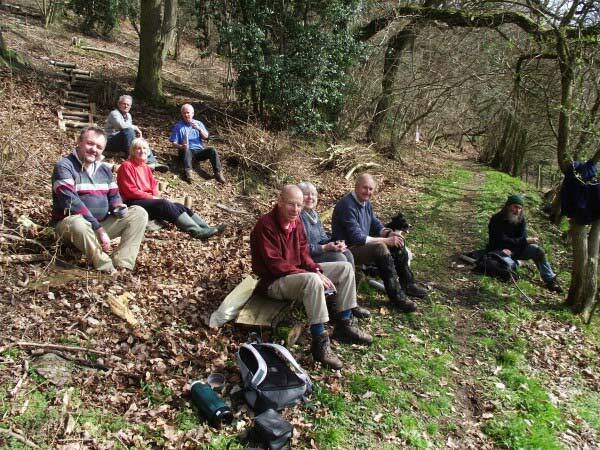 The work parties are enjoyable and sociable occasions; they provide a practical way for shareholders (and anyone else who’s interested) to get involved, and it starts to fulfil our aim of encouraging other quillet owners to take an interest in the wood’s long term welfare.